Leaving the Queens Film Theatre Belfast today I picked up a very impressive programme for the UK French Film Festival 2017. Although QFT isn't showing all the films being screened during the festival it is showing seven listed below. 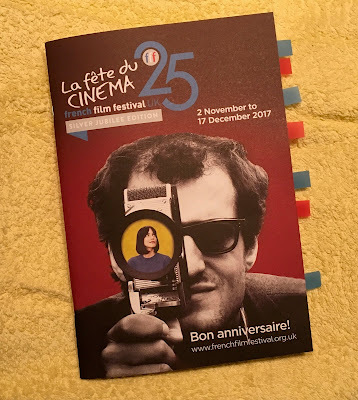 The Festival is celebrating its 25th anniversary and the silver jubilee edition of the programme has been extremely well produced and worth keeping as a souvenir reference guide. 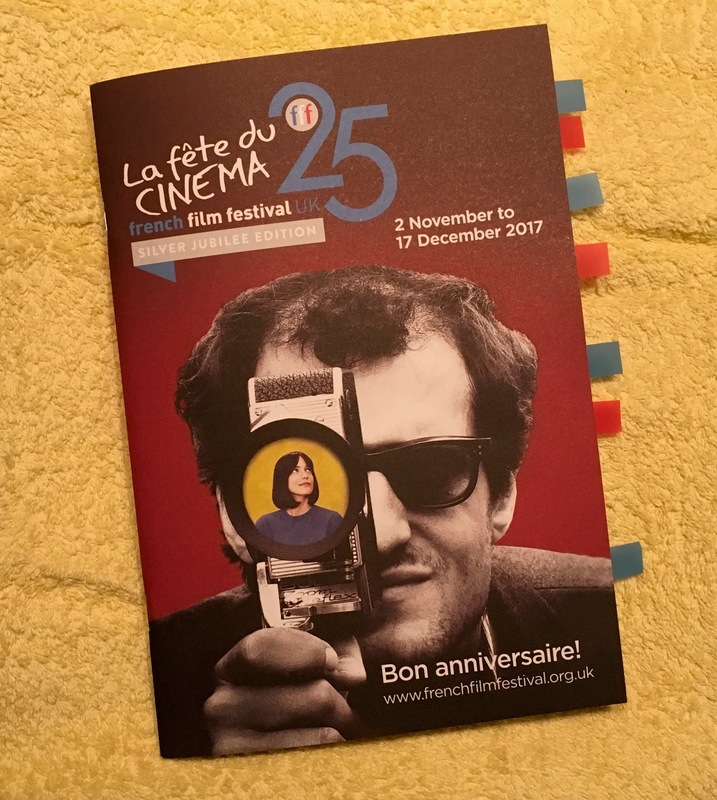 As a francophile and a francophone it's great to see the number of films showing and the range of cinemas taking part. The programme contains an at-a-glance guide to what's on and where. The films are helpfully cross-referenced to blurbs on the content and as well as offering contemporary films, the programme contains several classics. François Ozon's L'Amant double - The Double Lover on 14 December. Although I've viewed films back-to-back many times, I've not watched quite so many on a daily basis before. However, I'm making an old year's resolution to see all of them! What strikes me when reading through internet recipes for salade niçoise is the sheer variation of ingredients. Everyone it seems has a preference. This one prepared by ma conjointe certainly hits the spot. By the time I got around to taking the picture I had already devoured the luscious black olives but still on the plate are the French beans, tomato quarters, potatoes and anchovies. A lovely vinaigrette was served alongside. Notice too those quarters of hard-boiled egg. Egg features a lot on those internet recipes but not in my go-to source of French Cookery - Louis Saulnier's Le Répertoire de la Cuisine. Saulnier had the famous Auguste Escoffier as his mentor and the Répertoire is a quick reference guide to the master's cookery. Interestingly, the Répertoire does not include tuna either although many recipes do. One that I have to hand even states that Escoffier - there's Saulnier's mentor again - calls for tunny fish in oil to be added. It seems that a lot of the finished dish is down to personal taste. 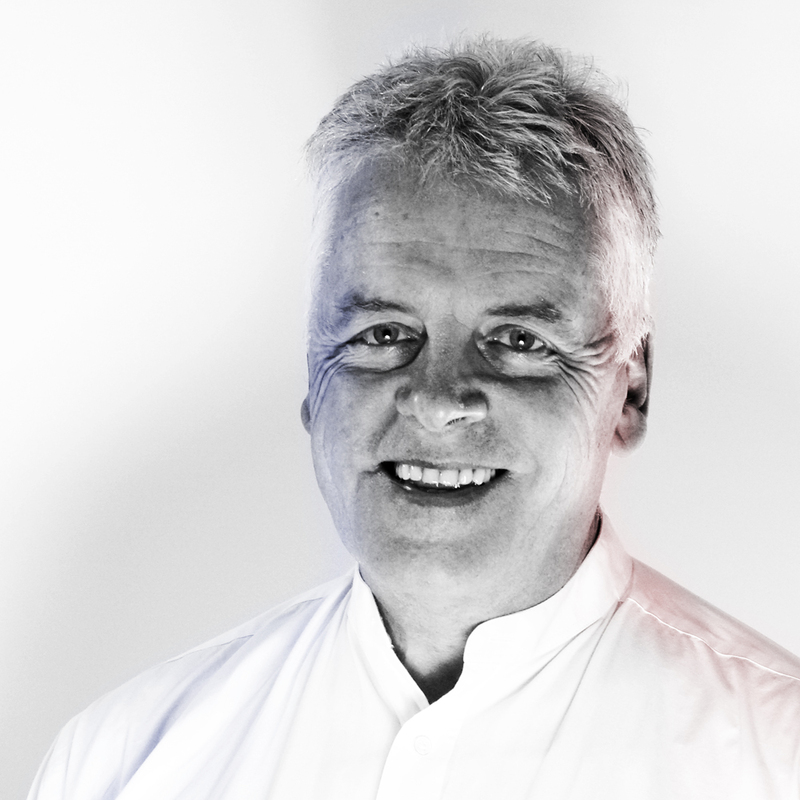 So what are your essential ingredients ? Do they depend on what you have to hand ? Or need to use up such as those slices of corn ? What's nice in your niçoise ? The Friend at Hand is more than just an Irish Whiskey shop in Belfast's Cathedral Quarter, it is also an emporium that houses a vast array of whiskeys and whiskey memorabilia; legacies of a bygone time which are definitely not for sale, providing instead a visible, authentic record of the many distilleries around the city in the 19th and 20th centuries. Among the items on display was the framed telegraph request pictured above. That evocative word - Cognac - near the top of the page caught my eye and, interest aroused, I noted the date: 8 August 1891. 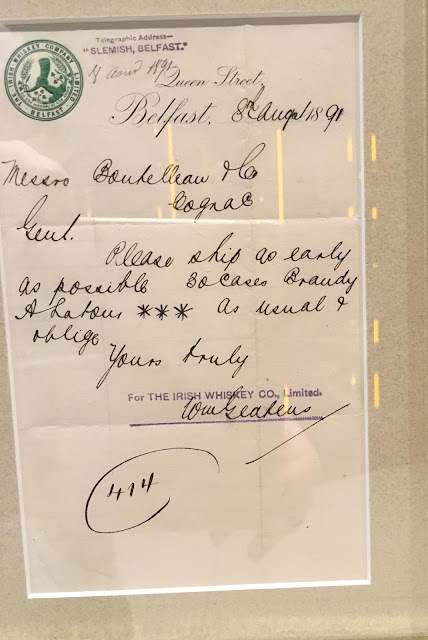 1891 - This is a remarkably well preserved document but I wondered what on earth was an order for brandy doing as a display item in a whiskey store. I set about finding out. The telegraph as you can see was addressed to a company in Cognac. This lead me to an internet search but my initial queries on Bouhelleau or Bonhelleau and other variants returned zero results. The solution lay in that lovely late-19th century handwriting style. Look closely at the words - Latour - and - truly. That fourth character in the company name is the letter T and gives us: Boutelleau. as I was instantly directed to the site of the Exposition Universelle des Vins et Spiritueux (EUVS) where after entering details of age and country of residence I found some information on Boutelleau. Why not take a quick look here ? If you've followed that link then you'll see, not a bottle of Latour 3* but, a cognac produced by Boutelleau and Co founded in 1849. That's some 42 years earlier than the date on the telegraphed order. The company was based in Barbezieux in the Charente and the label displays provenance from the Union des Propriétaires de Vignobles. Another link, this time at BrandyClassics.com states that the company "sold large quantities of fine cognac and were quite well known in their time." Clearly their fame extended beyond France to Belfast. But why is a whiskey company buying 30 cases of brandy ? One suggestion comes from the proprietor of The Friend at Hand - Willie Jack. Although the order was for 30 cases, probably around 250 litres, it is possible that the quantity requested came in an oak barrel or barrels which were much prized as receptacles for equally fine whiskey. That's because oak, which is virtually leak-proof, imparts both colour and taste to the liquid it contains. Could be. But one or even two barrels ? Is it possible that the writer meant casks but wrote cases? The order is very clear about the brandy required, the A. Latour 3*. Could that be significant? And then there's that quaint term: As usual and oblige. This is a frequent order then. But how frequent? Enough to have a regular supply of barrels or casks? But if they are making that order repeatedly what what would have happened to the brandy? 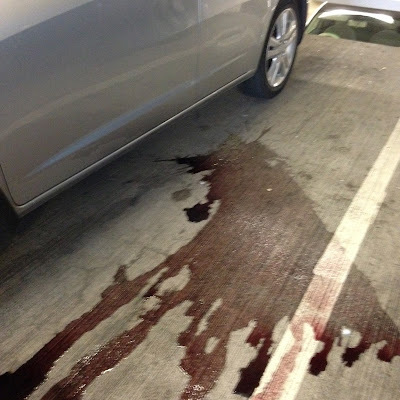 Given the old adage of never mixing the grain and the grape it is unlikely that it was added to a blend. Whiskey and brandy are both made in pot-stills, could that be a connection? Or did the Irish Whiskey Company simply have an outlet for the brandy? I'll be thinking about those questions, perhaps not too much, when I next sip a 3* VS.
And just as the whiskey went into brandy casks, my cognac will have been carefully poured into its own receptacle of fine, cut-glass Belfast crystal. Fair exchange don't you think? And I'll raise that glass to the memory of M. Boutelleau and the representative of the Irish Whiskey Company Belfast who way back then in 1891 were doing their frequent and entrepreneurial best to connect Cognac and Belfast. And in that spirit, I'll keep that connection going. Au revoir les K7 ! I had held on to them for ages - these old recordings from the BBC Radio French language courses À Vous La France and its follow-on France Extra! I had the pupil books to go with them and the teacher's guide too. They served me well in planning lessons all those years ago. Old friends. With space clearing at home it was time to say Au revoir ! to the K7 - cassette - collection. No one seemed interested in having the recordings in this format what with CD and MP3 downloads more easily managed. When I brought them for recycling I had a moment of doubt and regret. I'd miss having them around. So I took a quick picture to remind me of the time and effort put into setting timers to record; labelling the cassettes and creating the J-card covers. 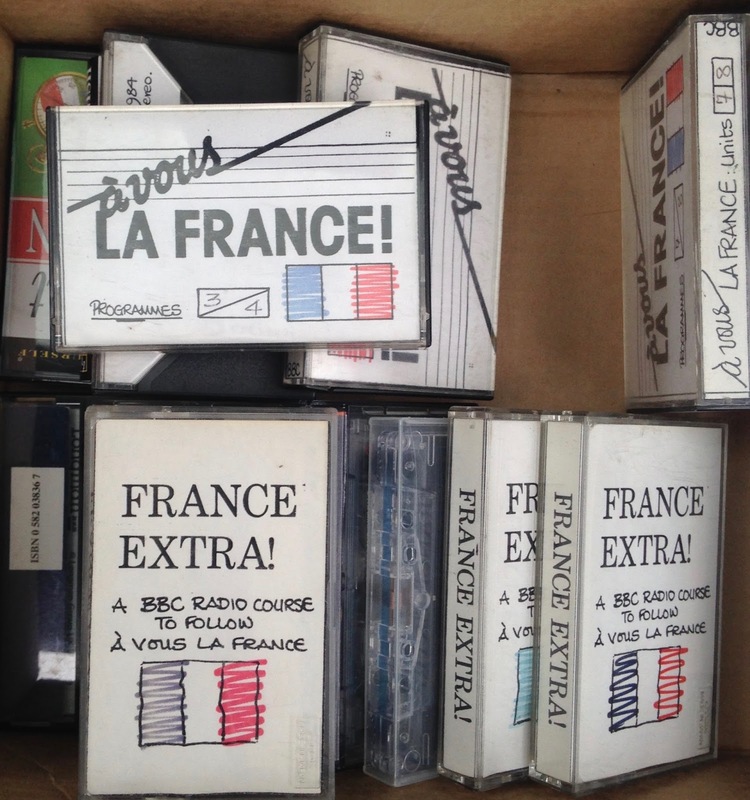 Labels: À vous la France, BBC, France Extra!, K7. I am very much looking forward to La Nuit de la lecture which will take place on Saturday 14 January 2017. To join, at least in spirit, with the event I intend to read the Kindle version of the book, Le corps de ma mère by Tunisian writer, Fawzia Zouari. It's a title that was recommended to me and it sounded my kind of book. Clicking on this link takes you to the Amazon Kindle store version where you can get more details. If you read or have read the book consider sharing your views and opinions in the comments section below... Saturday 14 January might be a good time for that.